Although the subject of this panel has not been firmly identified, it probably shows the Saint's bones being burnt on the orders of Julian the Apostate. The fire was then put out and the ashes were scattered. A veiled woman, wearing a girded gown and apron, standing on the lower right of the panel, pours what appears to be water from a shallow round vessel onto a pile of logs or fire in the lower centre of the panel. A man, wearing a doublet, bends towards the fire holding a spade or pitchfork. Above him stands a woman, wearing a horned headdress and a girded gown, also apparently pouring water onto the fire. A man, wearing a low-belted doublet, stands at the top right of the panel, holding his right hand to his head and with his left hand holding something over his shoulder. The top left corner of the panel has been restored in plaster. The panel is cracked right across in the middle. The left hand of the small figure near the fire is misisng, as well as the shaft of the spade or pitchfork which he holds. The left arm of the figure in the top right of the panel is missing. Green paint, looking very 'scrubbed,' remains on the usual daisy-patterned ground. The paint on the upper background looks modern. The top left corner of the panel has been backed with slate. There are two lead-plugged holes, one with a latten wire attached. The bottom has been cut away. Formerly in Genoa. Later in the possession of P. Nelson from whom it was acquired by Dr W.L. Hildburgh. On loan from him since 1926. Given by Dr Hildburgh in 1946. 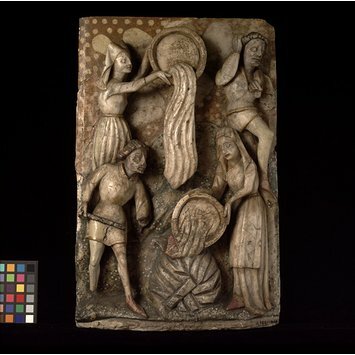 Historical significance: There are no other recorded English alabaster panels of the Quenching of the Ashes of St. John the Baptist. Alabaster panel depicting the quenching of the ashes of St John the Baptist (?). English, late 15th century.